WATCAC’s purpose is to promote the integration of blind and vision-impaired cyclists into the cycling mainstream. To this end, WATCAC organises a series of recreation rides, club rides, and tours to bring cyclists together and give them the opportunity to ride tandems. 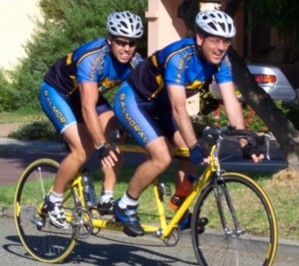 In the approximately 10 years to the early 80s, the Association for the Blind of Western Australia had organised tandem rides. WATCAC was formed in the early 80s to better promote tandem cycling as a part of mainstream cycling rather than as an activity solely for the vision-impaired. WATCAC has been very successful in this endeavour, with members and former members going on to become enthusiastic members of Perth’s cycling community. A number have gone beyond that to represent their state and country at national and international events including the Paralympics, some becoming medallists. WATCAC operates a number of hybrid, road and mountain bike tandems. All levels of cyclists are catered for with a range of tandems from mountain bike-style to high-specification road racers. Membership of WATCAC entitles members to use the tandems and to participate in WATCAC sponsored rides. Members are also entitled to hire tandems from WATCAC for extended periods.